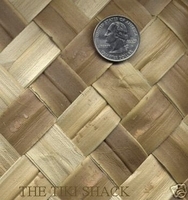 Wholesale matting, bamboo wall covering, bamboo matting, tropical Matting, Cabana Matting, tiki decor. Same as our other 4ftx8ft Lauhala Matting Rolls but sprayed with fire retardant. This is what we sell to businesses or customers that would like a piece of mind about the safety of using tropical matting. Fire retardant slows down the burning process but still will ignite and should never be confused that this is not fire proof. Please check with your fire marshall with any city codes prior to purchasing to make sure all of your questions our awnswered. These are sprayed to ordered and will take 4-5 days to dry before shipping depending on our weather conditions.